Strava’s annual “Year in Sports” report is out. The 37-page summary of what Strava’s members were up to throughout the year contains a number of interesting tidbits about how the diverse community of athletes structure their training. Here is a short summary of the most interesting running-related stats and facts from the report. 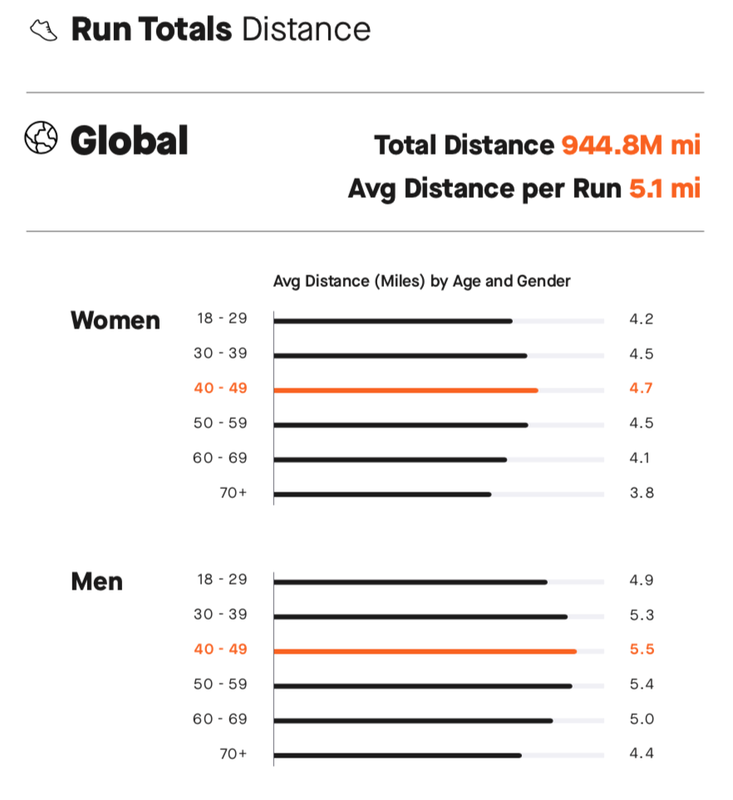 Around 8 million runners registered their runs on Strava in 2018, and all told they uploaded more than 240 million activities. The average run distance was 8.2 kilometres (5.1 miles) with 82 meters (271 feet) of elevation gain. Men and women in the age group 40 to 49 years had the longest average runs and the most average elevation gain per run. The average pace for all runs registered on Strava was 6:05 min/km (9:48 min/mile). Many runners swear by Tuesdays and Thursdays as their day for doing workouts, and the data from Strava seems to indicate that this goes for a majority of runners. The average run pace increases notably on these two days, with Wednesdays coming in as the third fastest day. Runners obviously like to keep their Sunday long runs controlled, and take it easy on their Monday recovery runs, because these are the two slowest days. Not everybody likes to race, and the data backs this up. Only 11.8% of male runners and 10.5% of female runners marked an activity as a race this year. That said, Strava runners clearly love marathons, and completed almost 886 thousand marathons all told! Yours truly was not the only runner on Strava who used running as a mode of transportation, getting to or from work. There were twenty-two million run commutes in 2018, with the average commute distance being 6.6 kilometres (4.1 miles). Runners from UK and Ireland were the most prolific commuters, logging an average of 3.29 commutes per week. Germans and Japanese runners came in second and third with 2.88 and 2.84 run commutes per week on average.